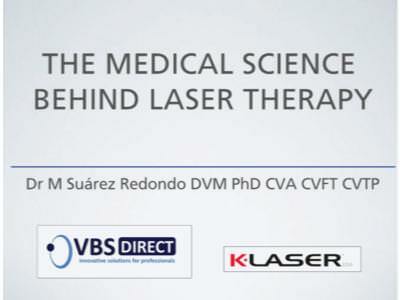 VBS Direct Ltd - The Medical Science Behind Laser Therapy - Innovative solutions for the veterinary professional. Review of the medical science behind laser therapy presented by Dr. Maria Suarez Redondo DVM, PhD, CVA, CVFT, CVTR. Dr Suarez is a soft Tissue Surgeon and Lecturer at Madrid Veterinary School and Director of the Integra Veterinary Centre. Author of numerous scientific publications and experienced lecturer on surgery, acupuncture and laser therapy. To view this webinar please click here.